First named (1977-78) "the Worms" this band has been called Edith Nylon in 1979. After some 12" and 7" the band has recorded this 2xLP in England in 1982. But one week before the release,, the band splitted. This record will never been solded. 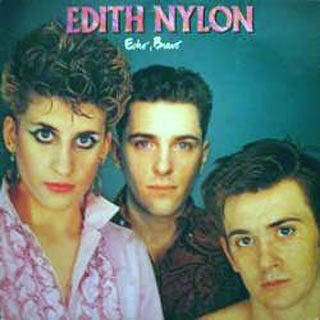 Edith Nylon was one of the best new-wave french band. Aram Kevorkian, Yahn Leker, Frédérique Lemarchand, Philippe Topiol et Rave Abissira. juste une question : pourquoi uploader morceau par morceau, et pas un fichier rar de tout le release d'un coup ? mais, sinon, trop bon... faut continuer longtemps comme ça ! ! ! Ca faisait un bail que je cherchais cet album. Alors bravo a toi et bonne continuation!Que du bon sur ton blog! tracks 5-14 are missing from DIVSHARE. Hi, could we have a re-up? Please ? Thanks. could we have a re-up ? In a one archive , if possible, please ? Many thanks. This is a record I have been looking for more than 20 years! Je cherchais Echo Bravo depuis des lustres. Edith Nylon c'est génial et que du bonheur : la mélodie,la voix,le son, le rythme, le souvenir de mes 20 ans. Autant j'adore mais j'adore tout le reste d'Edith Nylon, autant là.... c'est mauvais, très en dessous. On comprend qu'ils aient splités. Sinon je répète : je sui grand fan.